Canadian wing spiker Ryley Barnes has signed with Ural Ufa in the Russian Super Liga for the upcoming season. This comes on the heels of a successful season in France for the Tours VB club where he helped lead the team to the championship of the Men’s CEV Cup over Diatec Trentino. Barnes scored 13 points in the finals and was named the Best Receiver of the match with a 20% perfect reception rate. Barnes saw his first extended action with the Canadian Senior National Team this summer at the FIVB World League. 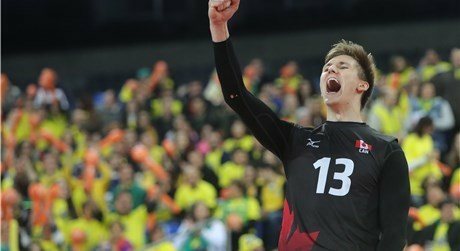 He played as a sub in three matches at the Final Six in Brazil, highlighted with back to back 10 point efforts, first in the semifinal loss against France, then against the United States helping to clinch the Bronze Medal for the Canadians. This was the first semifinals appearance for Canada and their first medal won at the yearly tournament. Ural Ufa finished in 7th place in Russian Super Liga for the 2016-2017 regular season, qualifying for the quarterfinals, before falling to Fakel Novy Urengoi. Ural Ufa has recently inked deals for the 2017-2018 season with setter Andrey Zubkov and middle blocker Igor Fillippov, both of whom played for Dynamo Moscow last season.